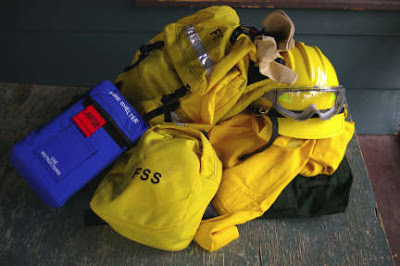 It was like Christmas today at the fire house as we opened boxes of new wildland fire gear. Things have been quiet lately. We have had some snow and rain, and the neighbors seem to be obeying the outdoor fire ban. So there is time for more training for us new guys before the season of lightning storms begins. No more turning out in jeans and denim jacket and the old yellow hard hat that I had in the basement. The new fire pack replaces the ex-German Army rucksack I had kept my stuff in. Meanwhile, we are preparing for the big chile cook-off. We talked about that today, discussed some key operational differences between the pumps on the two trucks -- and also discussed upgrading the telephone tree. Many of us live out of earshot of the fire siren down at the county road shop, so we depend on a telephone tree -- a group of people (usually at home) who will in turn call a list of firefighters. The discussion was enlightening. Mrs. So-and-so is increasingly hard of hearing -- do she and her husband even hear the siren if they have the TV on? Shouldn't someone replace her as one of the lead callers on the tree? Neighbors A and B rarely turn out for fires unless their own homes are threatened -- move them down the list! Neighbor C is all right, but he works outside the county these days, and if you catch him after 11 a.m. on a Saturday, he is usually on his way through a twelve-pack. And Neighbor D is probably not physically up to anything beyond directing traffic anymore. One volunteer assigned herself the task of calling everyone not present at today's work session and seeing if they still want to be on the telephone tree. And that is how the work gets done in the fire-fighting "militia."